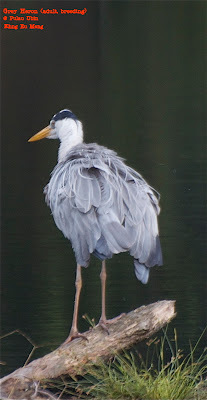 On the morning of 31 August 2012, while strolling along the track in the Lorong Halus Wetland, I passed by the usual suspects of Grey Herons (Ardea cinerea), which always park themselves on the buoys in the Serangoon Reservoir. But I noticed that one of them was standing closer to the bank, which wasn't a usual thing to do. So I decided to take some photos of it as it was within my lens' range. 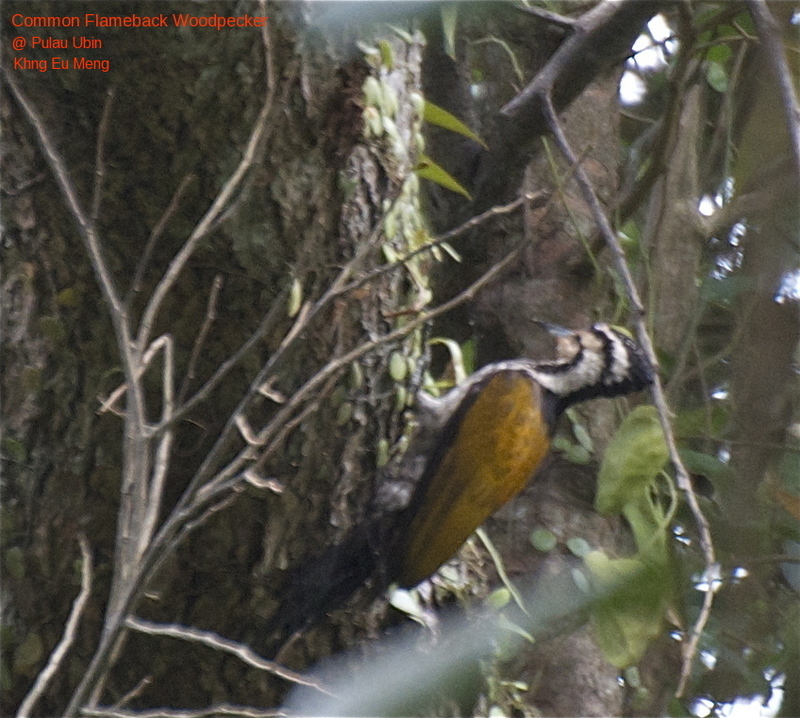 Through the camera view finder I noted a pinkish blob under the bird's neck and slightly to the left of its chest. 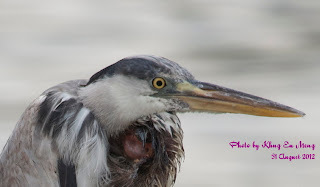 I thought it had suffered a flesh injury from a fight with another heron. It frequently bent its head to stroke the pink flesh. Upon blowing up the picture on my notebook, I saw that there was a tiny beak poking out from where the pinkish flesh was. I was blown off my seat as it was a very young almost featherless chick that was tucked under the parent's wing. Is this method of caring for its young usual for Grey Herons? I always saw the nestlings in their tree-top twigs nests in the Pasir Ris Park, so this was a surprise. 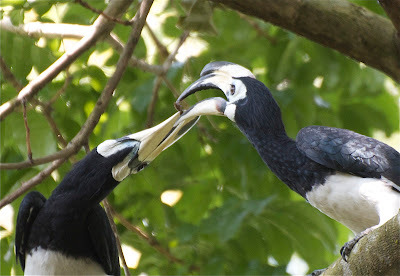 Interestingly, when the adult flew off, the chick didn't fall out. How was this possible? 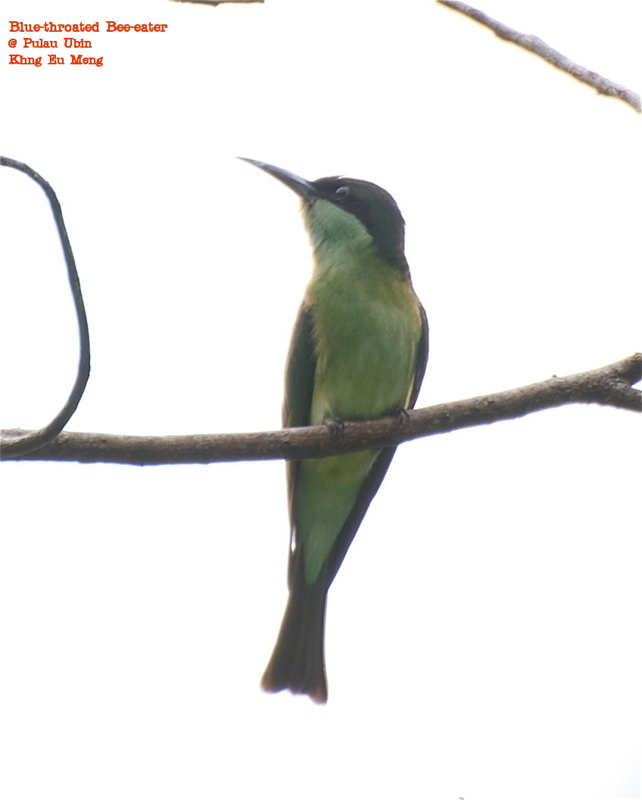 BESIDES broadbills, hornbills, owls, pittas, sunbirds and kingfishers, the barbets are another favourite bird of mine. They are not always easy to spot, being largely greenish, which blend them with the foliage. What fascinates me is their colourful heads of red, blue, yellow and black. 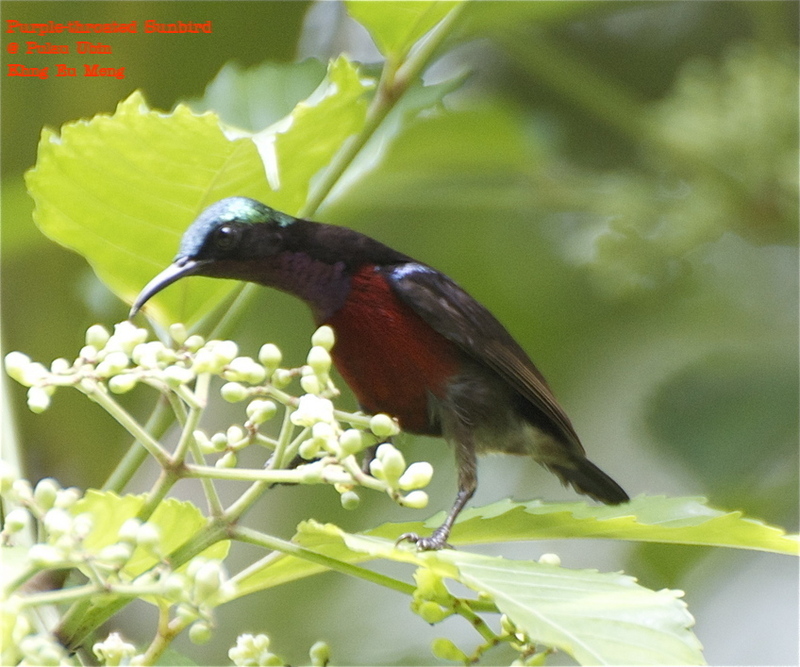 The Taiwanese call them 五 色 鸟 or five-coloured bird. 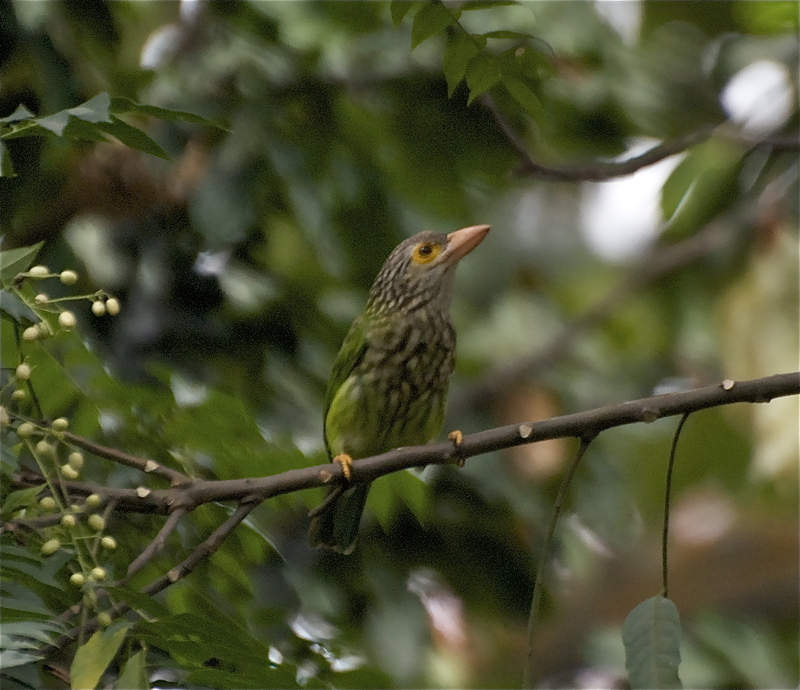 Only the Lineated Barbet is less colourful with just green, streaks of brown, yellow and white. There are Asian, African, American and even Toucan-barbets. 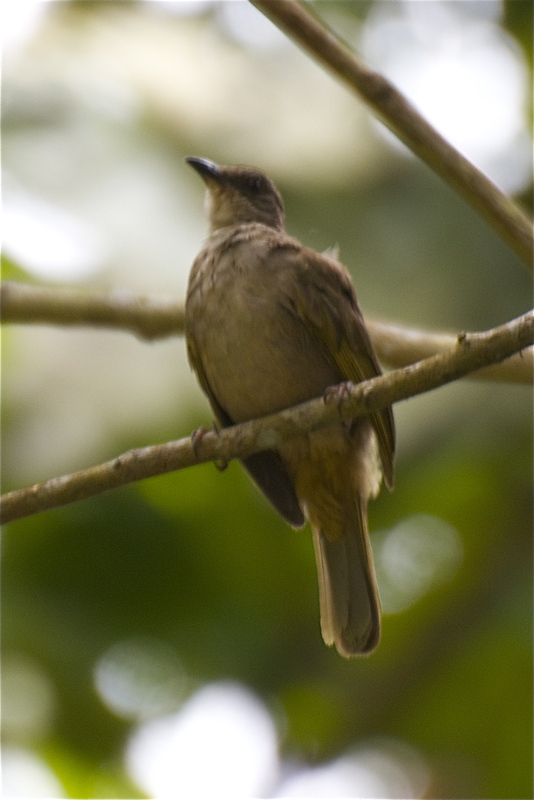 These birds frequently stay high up in the canopy of trees and one is lucky if this bird is seen perching at a low position. This blog will focus mainly on the Asian barbet, the Megalaimidae. 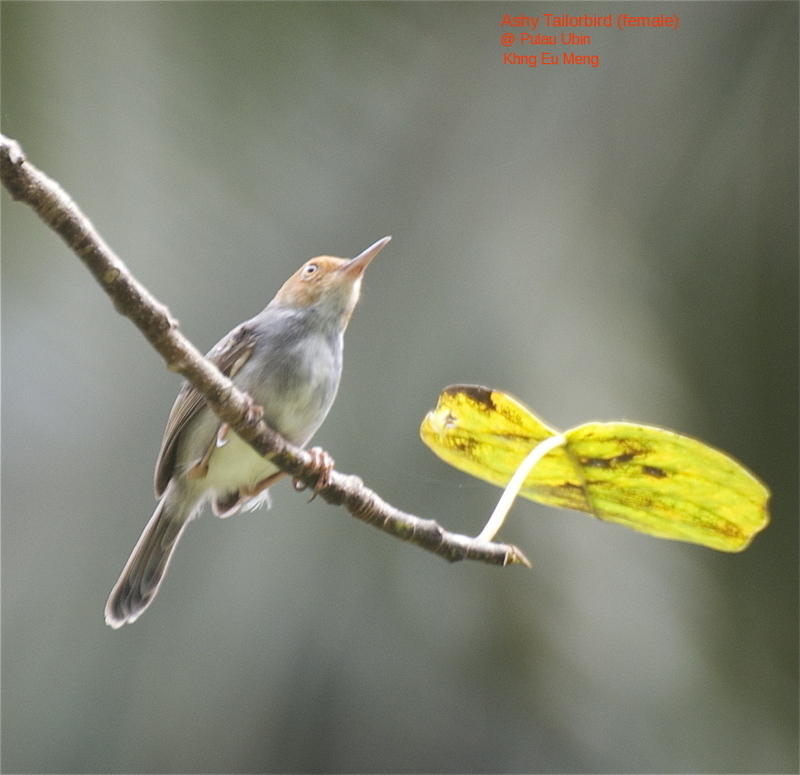 There are about 26 types, which can be found from Tibet to Southeast Asia. Most of them concentrate around the Malay Peninsula and Indonesia region. They are usually plumpish, have large heads and thick bills with bristles growing above the top bill. 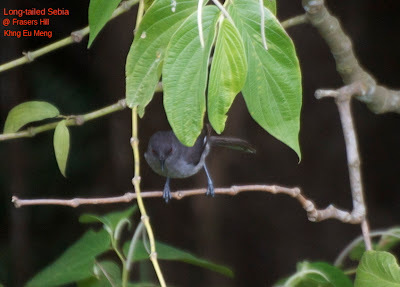 The ones I have come across are rather territorial in nature and often respond to bird calls; they quickly come to check who had dared to intrude into their territory. 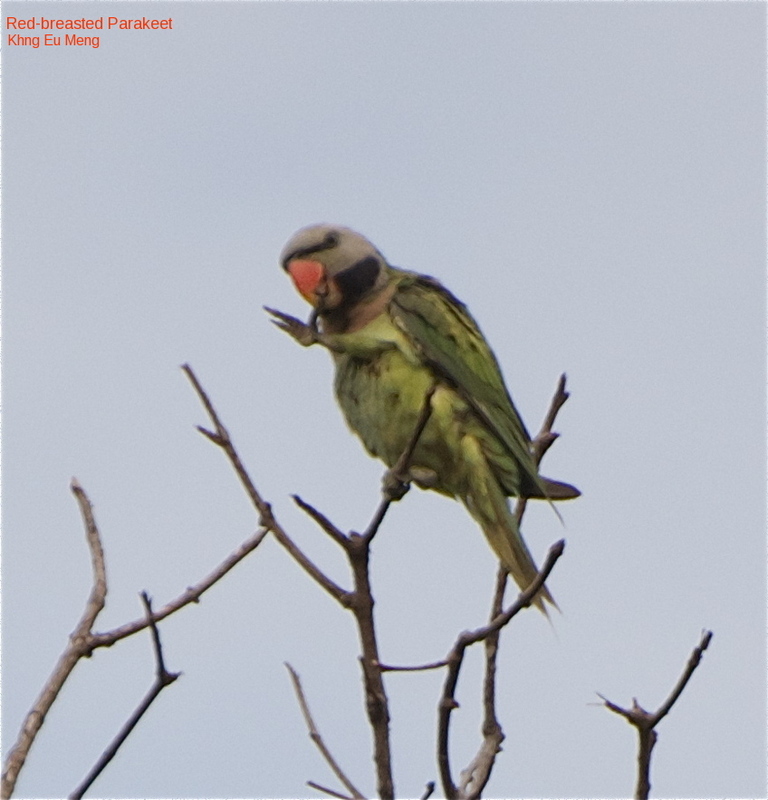 The barbets do not sing melodiously but make staccato calls, which make them easy to notice should they be around. They are not only found in forested areas but also in city parks. The attractive Coppersmith Barbet is an example. 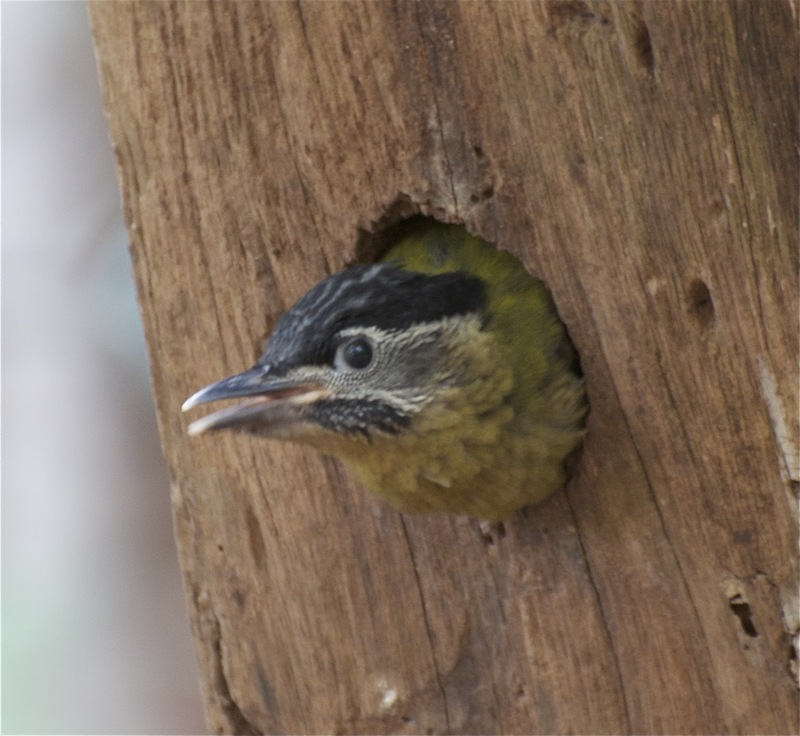 Like the woodpeckers, they bore into tree trunks to make their nests; they lay between two and four eggs each time. Their diet consists mainly of fruits and insects. But some have been known to eat small vertebrae such as frogs and lizards. 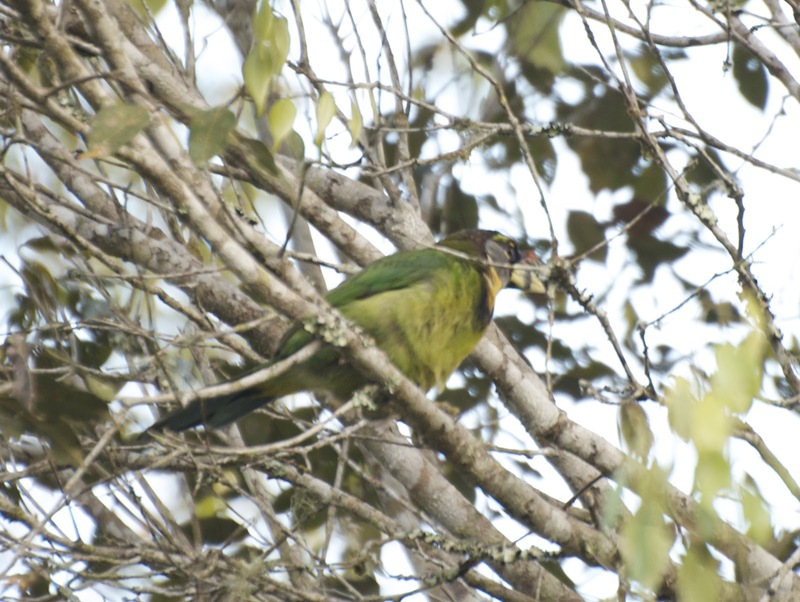 Barbets tend to be solitary birds, according to the bird experts. I have seen small groups of them feasting on the fruits of trees and they seem to coexist well. I noted that in both Taiwan and Singapore. 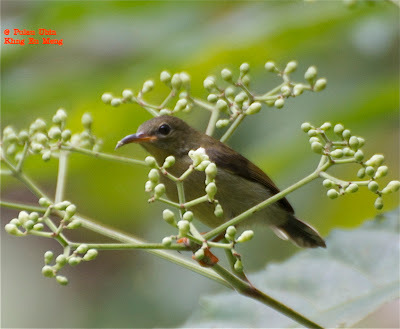 I shall be adding new photos as I spot these barbets, so this is a blog in progress. The trogon is not just winsome with striking colours of scarlet, blue, brown and a host of other colours, it has a stately pose, too. 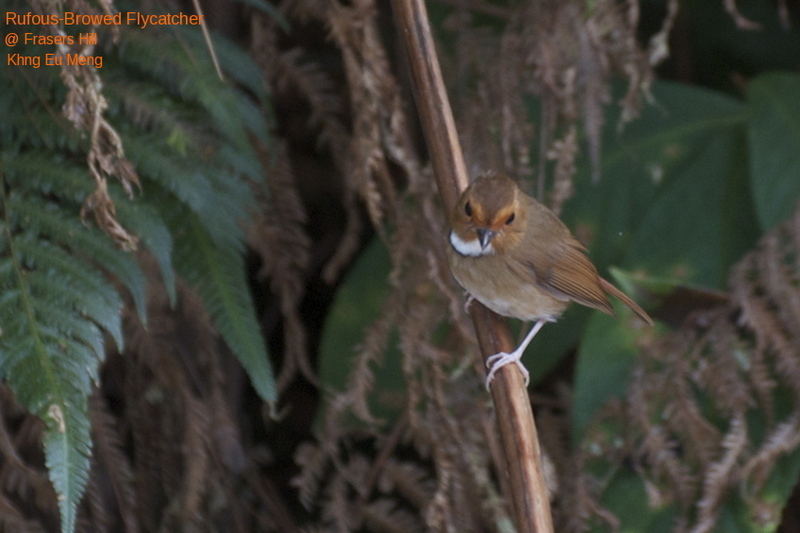 It's always great to spot one in the open as it can be shy and will fly off in a flash when humans arrive. The trogons are an old-world bird and their fossil records date back 49 million years (mid-Eocene)! 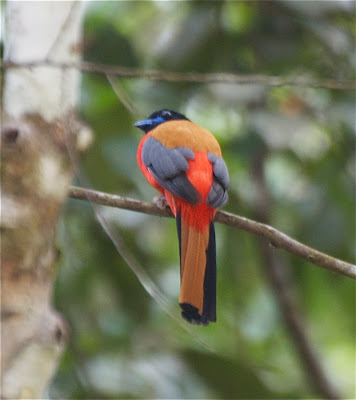 The word trogon is a Greek work for "nibbling" as the bird gnaws holes in tree trunks to build its nest. They belong to the Trogonidae family; there are 39 species in eight genera. These photos will hopefully kick-start my collection of trogons. My first visit to Panti in Johor two months ago ended in failure - I heard the bird calls but saw none. 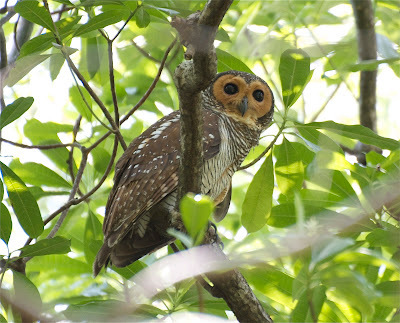 Revisiting it with two fellow birders on Tuesday saw fortune and luck in reverse. 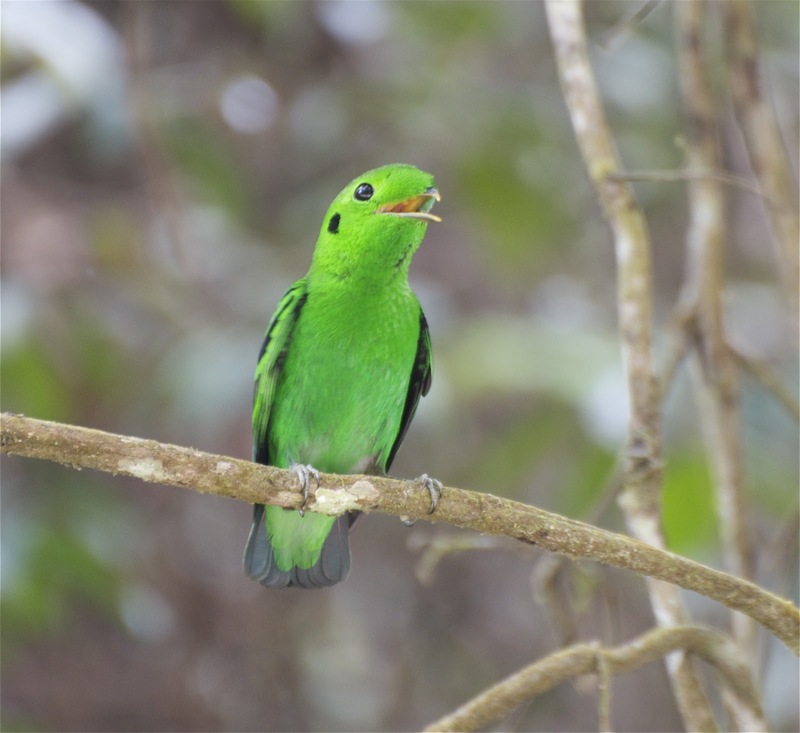 The prize catch was a pair of the Green Broadbill (Calyptomena virisdis), said by some to be rather hard to see, and not just because its green feathers camouflage it so effectively. 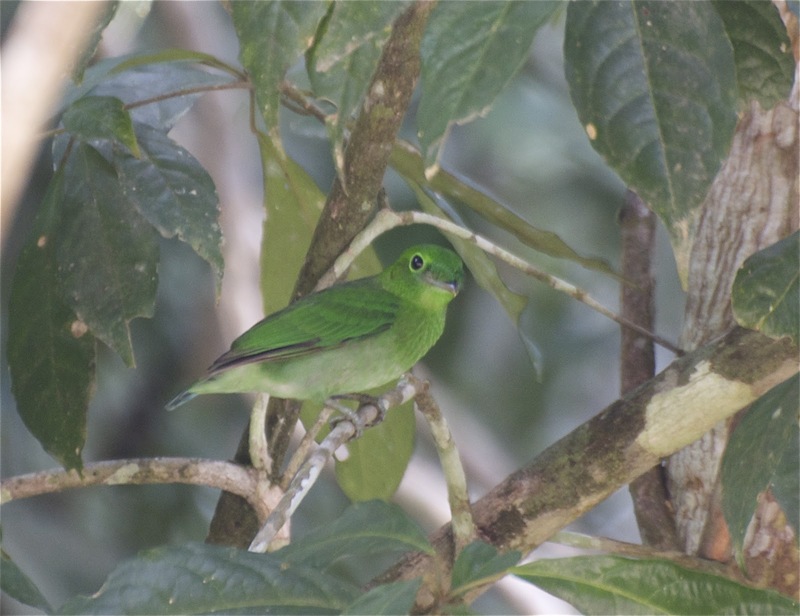 The place we were at was said to be populated by Green Broadbills. We didn't see any for a while. But something green flashed by the corner of my right eye and without thinking I took a photograph of it. It was blurrish but was confirmed to be a female broadbill. We played its call and soon the male appeared. 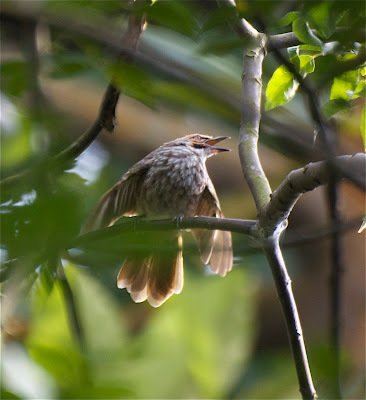 But we play bird calls sparingly as it may stress them. The male bird made very clear its stand to defend their territory. 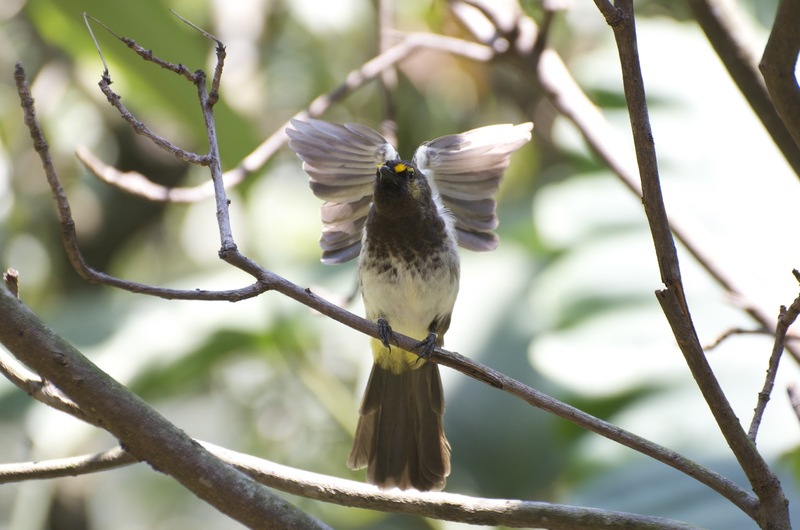 It responded by calling out loudly and fluffing its neck feathers. And that's when we were able to take these very clear, unobstructed photos. 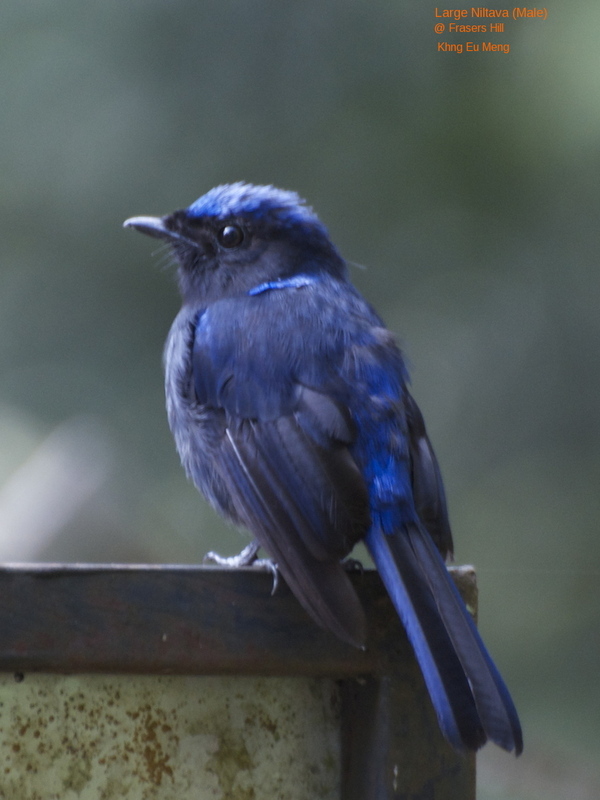 It is a queer looking bird as feathers cover the top part of its beak. 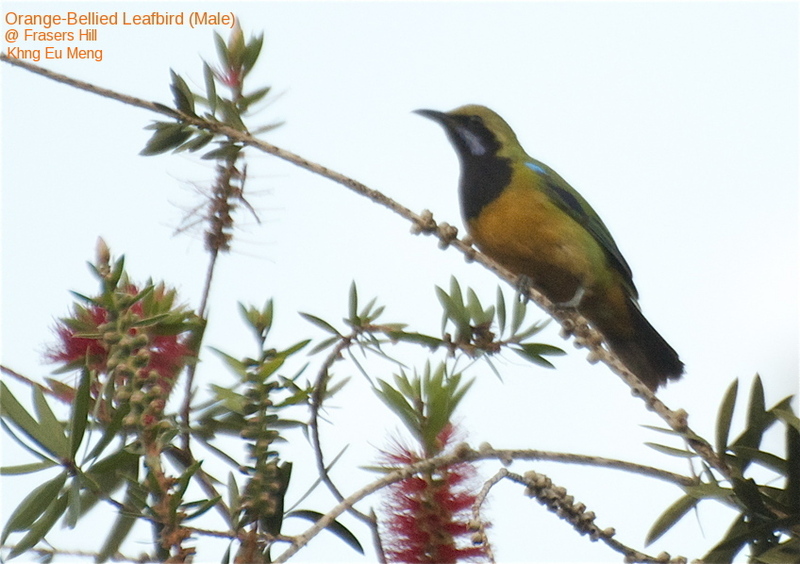 And the green feathers were luminously bright, a visual treat indeed it was. The past two weeks have been rather fortunate for me as I managed to capture on camera some rather fetching moments of our feathered friends in Singapore. I hope you will enjoy these photos and may they gladden your heart. 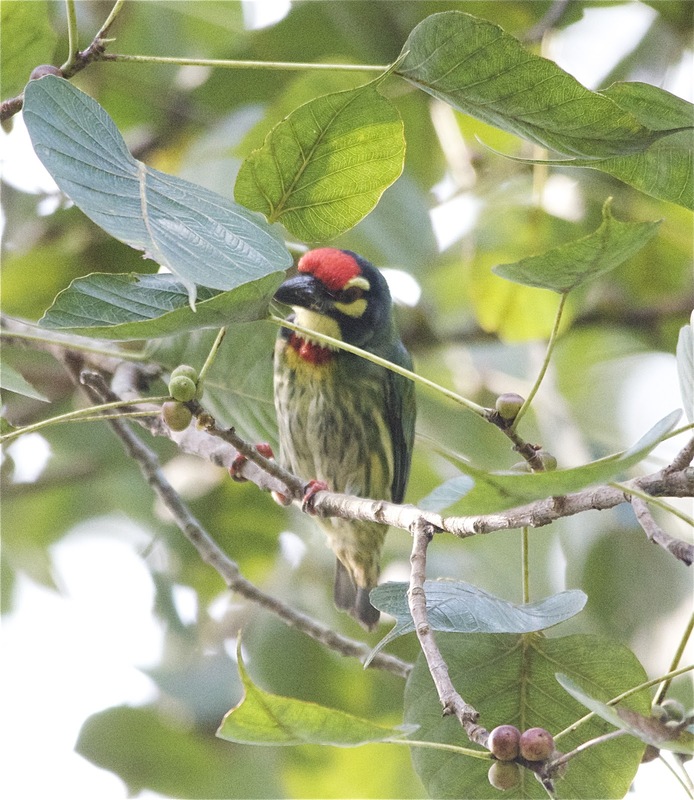 Showing its displeasure to a Lineated Barbet on a nearby branch. Pulau Ubin is now famous for its population of the Oriental Pied Hornbill (Anthracoceros albirostris), which went extinct a long time ago in Singapore. 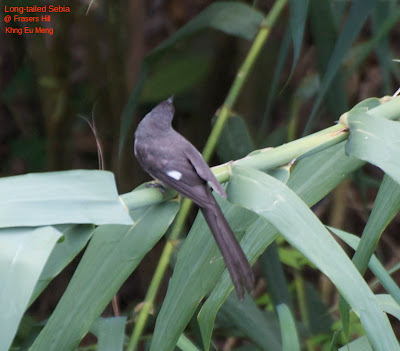 Through a concerted breeding programme, this bird is now thriving not only in Pulau Ubin, but also in parts of Singapore, including Sungei Buloh Wetlands, Singapore Botanical Gardens and even on the Nanyang Technological grounds. A short 12-minute bum boat ride from Changi Point is all it takes to go to Ubin*. But at Changi Point, you are preempted by the large flocks of parakeets calling loudly in the trees. 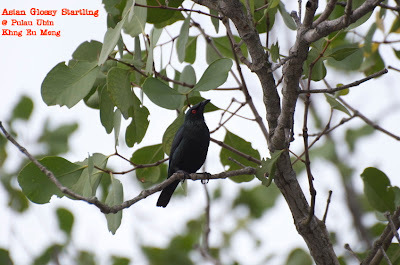 Over at the Ubun landing point, kingfishers and the red-eyed Asian Glossy Starling can be seen in the trees. 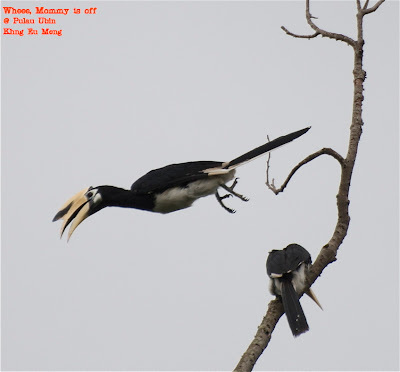 And if you are lucky, you can see the hornbills fly past, too. In Ubin, you can either walk, which is the best way to spot birds, rent a bicycle or take a van to various destinations. During the weekday, there are relatively fewer visitors and vehicular traffic. The roads, though small, are in quite good condition. 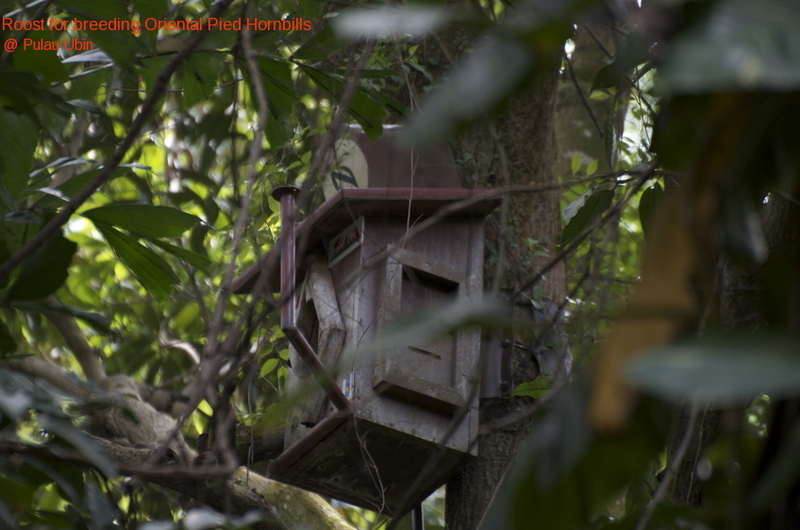 The resident human populations is also quite small, so vegetation is lush and birdsong is heard all round at any time of the day. 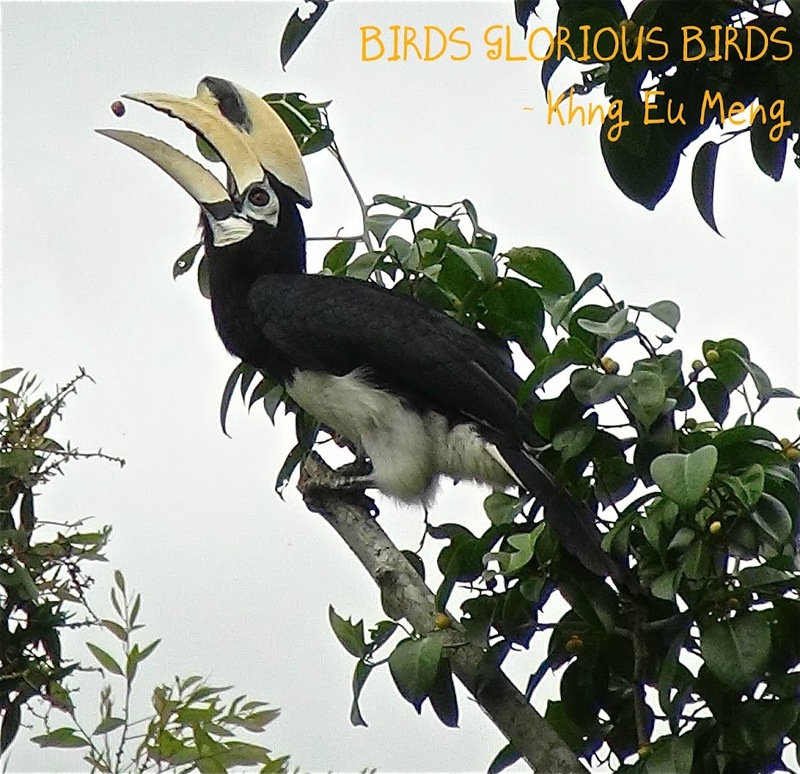 During a recent morning's visit, I saw some of these birds, which I managed to capture on camera. 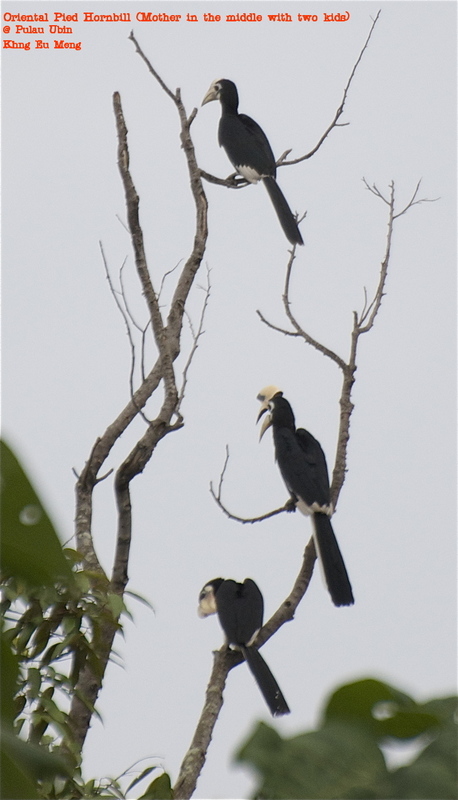 You can't mistake the loud calls of the Oriental Pied Hornbill (below), they are quite noisy but their calls are such a delight to hear. By the way, the hornbill taking off, is the Daddy, not Mommy. Ambling through the little roads, which have trees and shrubs on both sides, I saw doves eating by the roadside, sunbirds using their thin curved beaks to extract nectar from the flowers of the trees, bulbuls and pink-naped pigeons sitting quietly on the branches and hear the tok-tok sound made by the woodpeckers. By the shores of the quarry are herons and egrets, kingfishers and swallows. On one cable, I spied a female Ashy Tailorbird pursued by two amorous males. 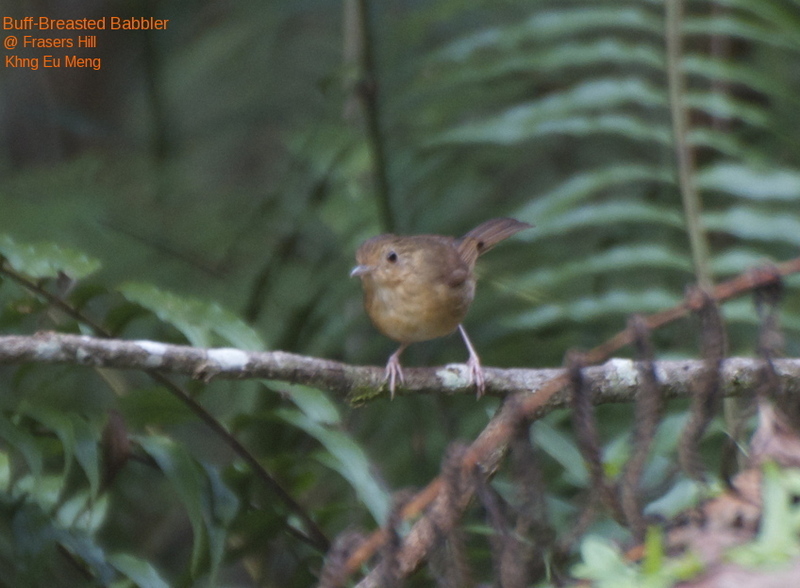 Tiny in size but their trills are loud, giving the impression that they came from much larger birds. Here's a pictorial display of these birds. 4. 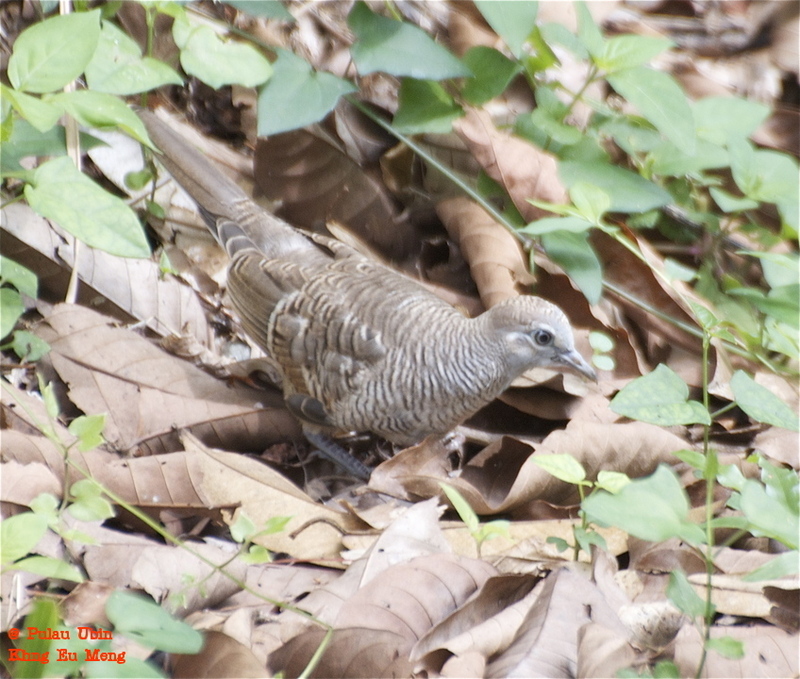 Spotted Dove (Streptopelia chinensis), juvenile ?? 5. 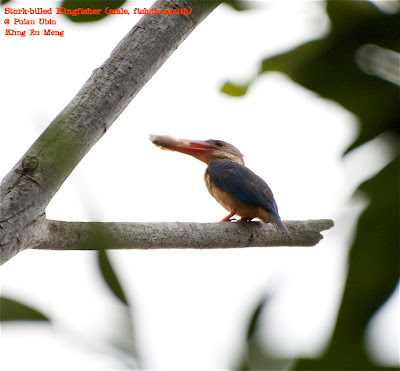 Stork-billed Kingfisher (Halcyon capensis), male, with fish-in-mouth. 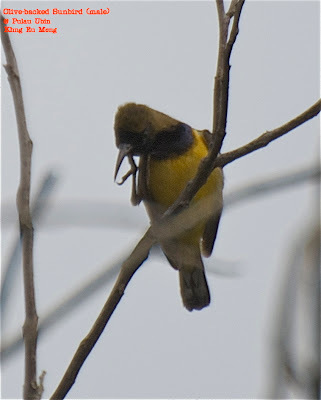 It held the fish in its beak for a long time, probably using it to attract a female. 12. Red-breasted Parakeet (Psittacula alexandri), male. Seen at Changi Village. * Mosquito repellant application is a must and watch out for the ants, some do bite. * Food and drinks are available at the shops by the jetty. * Toilets are found only at the main attractions, such as Chek Jawa and the NParks Visitors' Centre. But there are plenty of bushes around. * Boat fare per person per way is S$2.50, or $30 if you charter the whole boat. There are about 300 known bird species of birds up in Fraser's Hill, Malaysia. 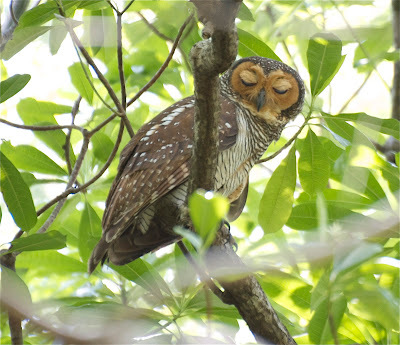 I've long heard about how easy it is to see these feathered creatures and finally on July 6-7, 2012, I was able to spend two days up there. 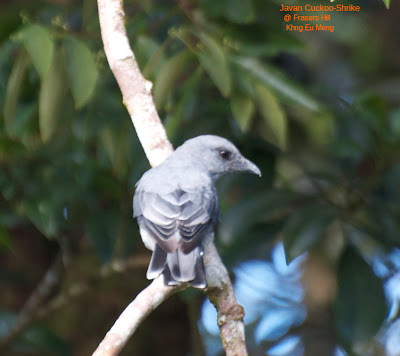 My local bird guide, Terence Ang, a knowledgeable man, commented that bird populations were thinner this time. That could be due to many reasons - not much rainfall, end of nesting season, etc. But no matter. For me, I saw about 20 types of birds on that trip, not a record, but decent sightings. 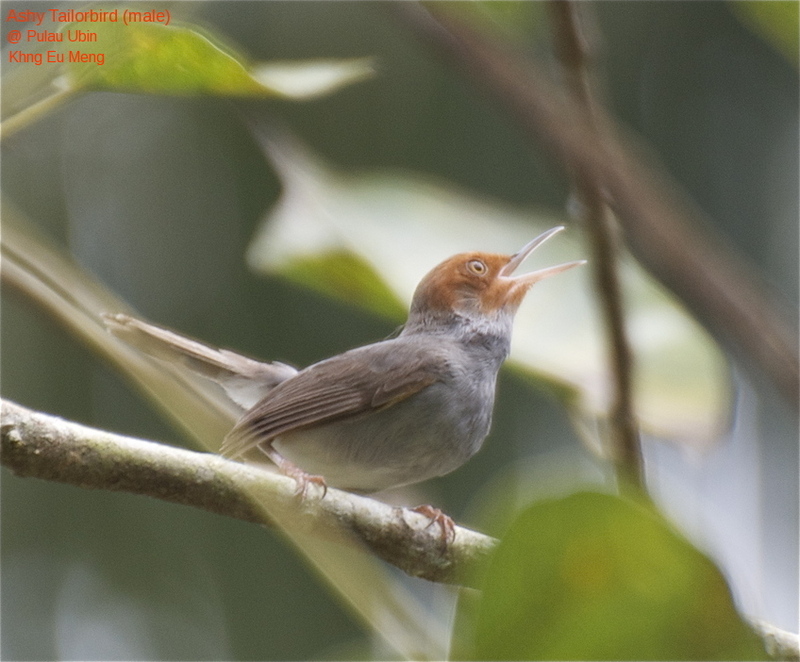 (I saw more bird species in Khaoyai/Pakchong, Thailand - see earlier blog). 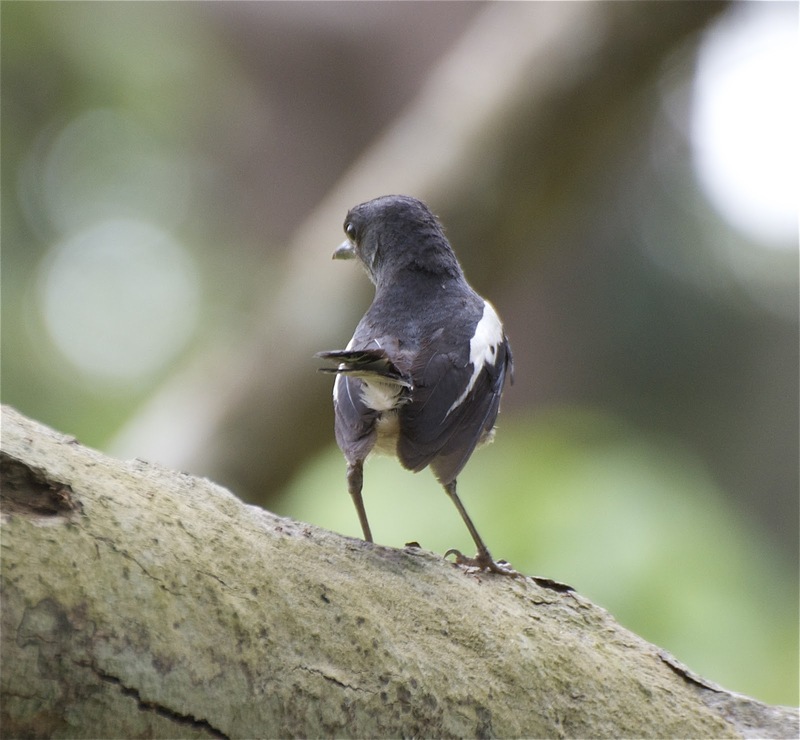 And importantly, all except one, the Magpie Robin, were lifers. Fraser's is in the state of Pahang, but the road up starts in Selangor. A piece of good news: there is now a road up and one that comes down. It used to be one road for up and down traffic and there were timing intervals to make either an up or down trip, the road being wide enough for only one vehicle. Compared with the other hill resorts of Malaysia - Cameron Highlands, Bukit Tinggi - Fraser's is relatively quieter during the week day, which is great for birders. The scenery up there is gorgeous and you can see these photos on the Web. The air is fresh, cool, stench-free (unlike Cameron's), no swarms of flies and the little roads are in good condition. 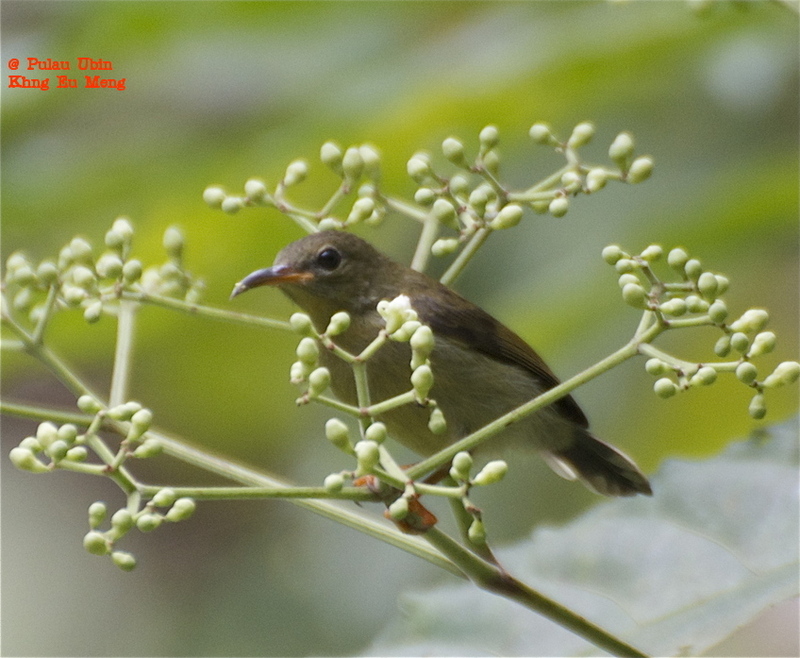 Vegetation looks rich and healthy and best of all, birds can be seen in every direction. 1. 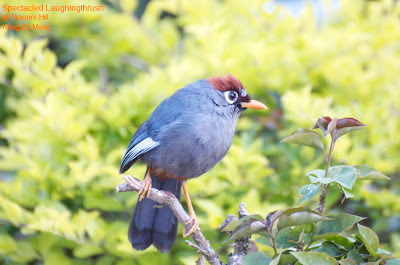 Spectacled Laughingthrush (Garrulax erythrocephalus), below, formerly known as Chestnut-capped Laughingthrush. 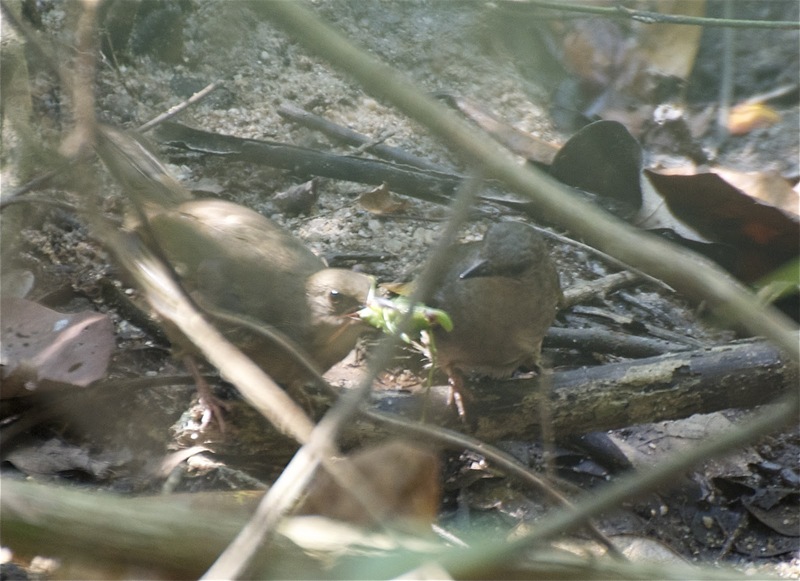 They are easily seen at places such as Bishop's Trail and Jelai Resort. They are quite used to human presence. 2. 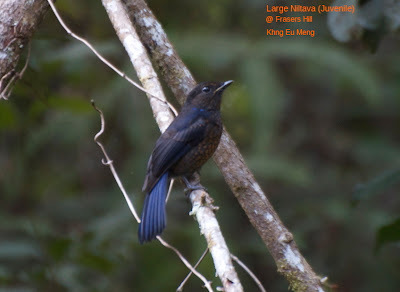 Large Niltava (Niltava grandis), below, adult male. 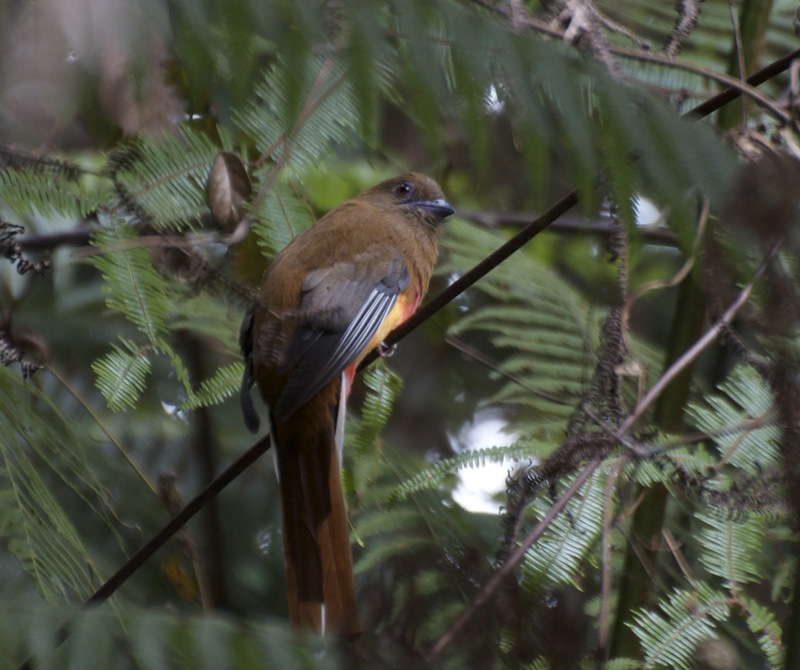 It had just had its breakfast and was perching quite contentedly by the Bishop's Trail. 3. Large Niltava (juvenile), below, identified by the scale-like feathers on its breast. Seen at Bishop's Trail. 4. 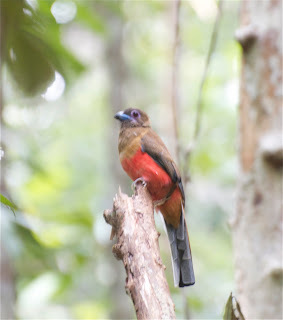 Red-headed Trogon (Harpactes erythrocepphalus), female, below, seen at Telekom Loop. 5. Javan Cuckooshrike (Coracina javensis), below, seen at Jelai Resort. 6. Orange-bellied Leafbird (Chloropsis hardwickii), below, seen at Jelai Resort. 7. Buff-breasted Babbler (Pellorneum tickelli), below. Seen outside Hemmant Trail. 8. 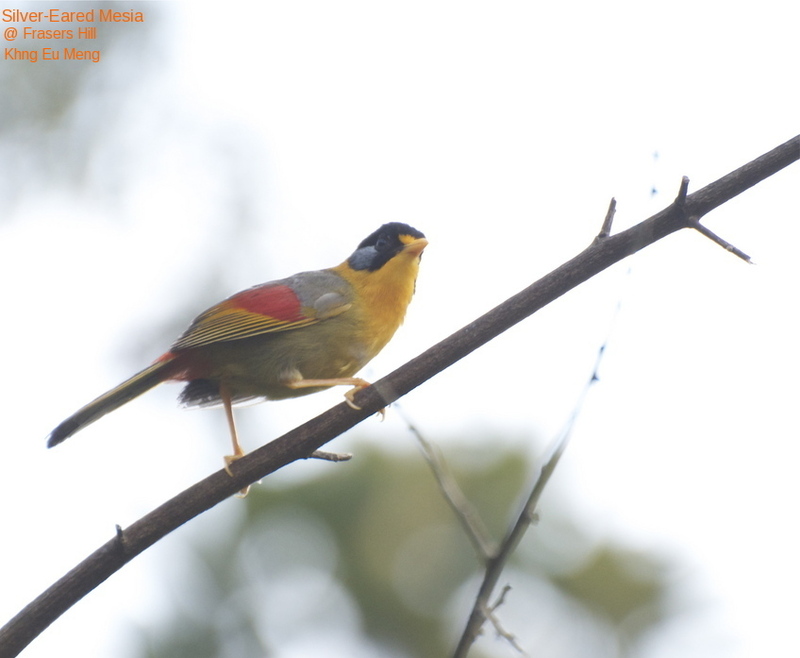 Silver-eared Mesia (Leiothrix argentauris), below, moves in flocks. Seen at Jelai Resort. 9. 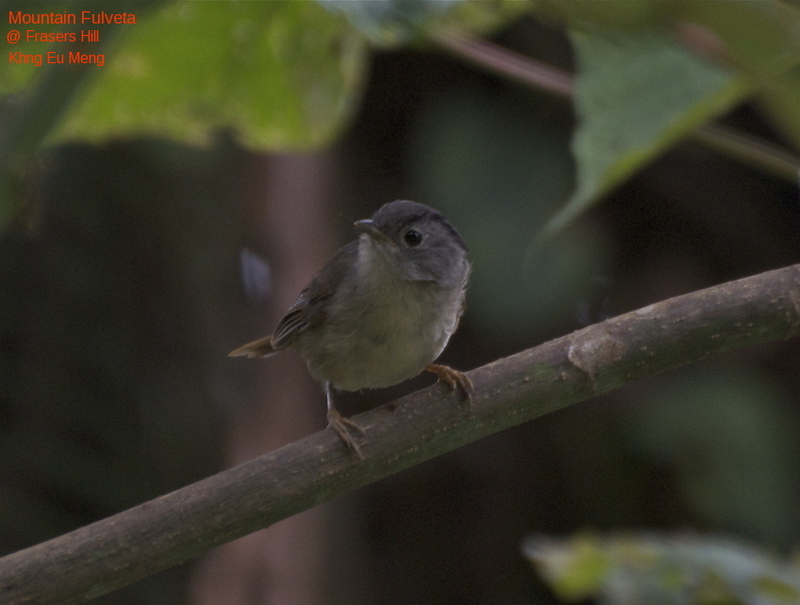 Mountain Fulvetta (Alcippe peracensis), below. 10. Long-tailed Sebia (Heterophasia picaoides), front view, below. 11. 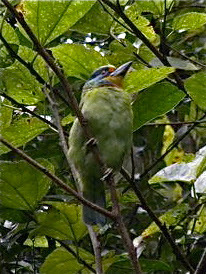 Fire-tufted Barbet (Psilogon pyrolophus), below. 12. Rufous-browed Flycatcher (Ficedula solitaria), below. 13. 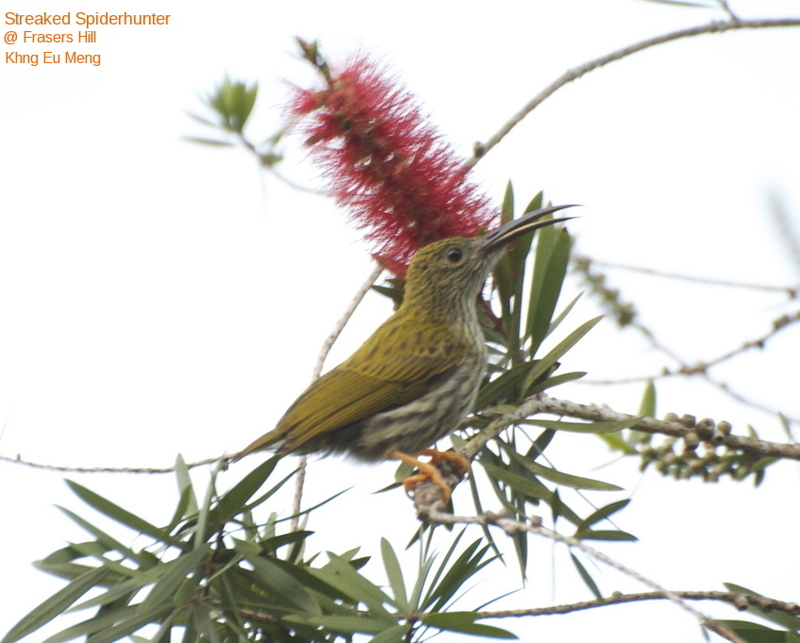 Streaked Spiderhunter (Arachnothera magna), below, seen at Jelai Resort and Silverpark Resort. 14. 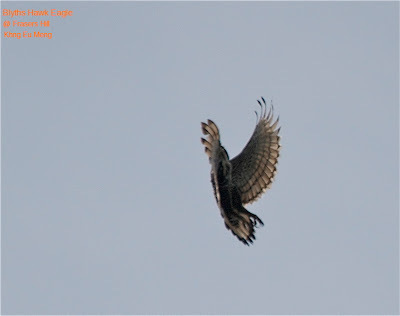 Blyth's Hawk Eagle (Spizaetus alboniger), below. To all the birds of this world, a big thank you for simply being there.